On April 9, 1865, Elias Hoppes was one of nearly 65,000 Federal soldiers to arrive at Appomattox Court House, Virginia. In a 1909 article about his military service, Hoppes said he had arrived in the county seat of Appomattox having not eaten for two days. It was during his search for food that he made his way into the county courthouse. Once there he found “many rolls” of Confederate currency. After stuffing the notes into his clothes, he began looking around for other items to take as souvenirs of his military service. He found a revolver in a desk and also decided to grab a mail bag containing what he thought to be “numerous letters ready to be sent to Lee’s army giving news and the operation of Grant’s army” which he dutifully “threw to the four winds.” The location of these and other mementoes Hoppes took that historic day will most likely remain forever unknown. Yet there is one item this Pennsylvania soldier carried home that recently managed to find its way back. 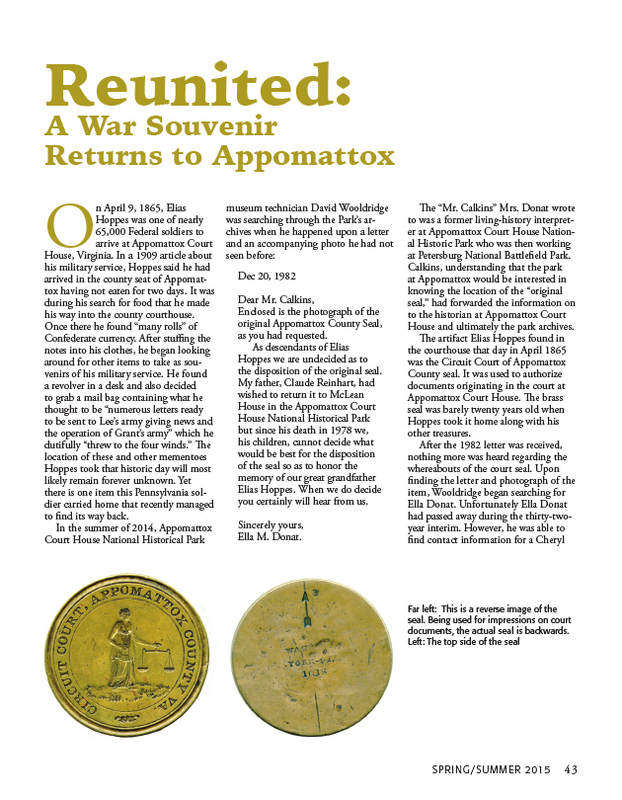 Enclosed is the photograph of the original Appomattox County Seal, as you had requested. As descendants of Elias Hoppes we are undecided as to the disposition of the original seal. My father, Claude Reinhart, had wished to return it to McLean House in the Appomattox Court House National Historical Park but since his death in 1978 we, his children, cannot decide what would be best for the disposition of the seal so as to honor the memory of our great grandfather Elias Hoppes. When we do decide you certainly will hear from us.